Iranian Defense Minister Hossein Dehgan and his Chinese counterpart, Chang Wanquan, signed an agreement on November 14 pledging closer military cooperation in a number of areas including military training and counterterrorism operations. Both sides also pledged to hold joint military exercises in the near future. The Chinese defense minister arrived in Tehran on Sunday for a three-day visit. 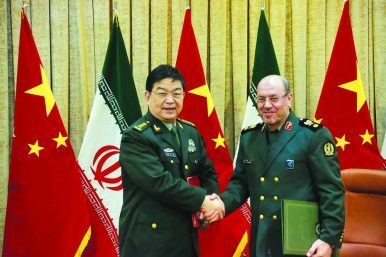 Chang Wanquan expressed confidence that Iran-China defense ties will be strengthened in the years ahead. “The upgrading of relations and long-term defense-military cooperation with China is one of the main priorities of the Islamic Republic of Iran’s defense diplomacy (…)” Iran’s defense minister said, according to the Tehran Times. “We assess the visit of the Chinese defense minister in line with this (Iran’s defense diplomacy,” he added. Iran-China defense ties have progressively grown stronger in the last couple of years. In 2014, for the first time ever, Iranian and Chinese navies held a joint naval drill in Persian Gulf waters. This was preceded by a visit of Iranian warships–the destroyer Sabalan and the helicopter carrier Kharg—to the port city of Zhangjiagang port in Jiangsu province in China in 2013. In 2014, a first ever visit of an Iranian Navy chief to China occurred discussing anti-piracy cooperation and humanitarian assistance/disaster relief operations among a range of other issues. Furthermore, in October 2015, the deputy chief of staff of the People’s Liberation Army Navy (PLAN), Admiral Sun Jianguo, met with Hossein Dehgan to lay the groundwork for deeper future military cooperation. China and Iran maintained close military-to-military contacts throughout the 1980s and 1990s. Among other things, China helped Iran boost its anti-access/area denial (A2/AD) capabilities by selling tactical ballistic and anti-ship cruise missiles (e.g., HY-2 “Silkworm” anti-ship missiles), advanced anti-ship mines, and Houdong fast-attack boats (equipped with anti-ship missiles) to the Islamic Republic. China also provided technical expertise to Iran by, for example, helping develop Tehran’s indigenous Nasr anti-ship cruise missile. “Chinese design and technology can be seen in many Iranian missile series, from the short-range Oghab and Nazeat missiles to the long-range Shahab 3,” a 2012 RAND study explains. However, defense ties appear to be on the upswing again. As I reported in 2015, China allegedly has agreed to sell 150 J-10 multirole fighter jets to Iran. The deal has neither been confirmed nor denied by officials in either country and is likely only to happen (if at all) following the lifting of the UN arms embargo on the sale of offensive weapons systems in 2020. Deeper ties between China and Iran are a worrisome development for U.S. military planners given the burgeoning A2/AD capabilities of the Iranian and Chinese militaries and the danger they pose to U.S. military assets in both the Middle East and Asia.